Wow! Rather a long gap between Retrospectives 4 and 5. Very sorry for the hiatus between June and September. Hopefully the remaining Retrospectives will follow on a bit quicker. In my defence, I’ve been working away at another couple of projects – a Euro board game called ‘Dolphin Adventures’ and an introductory board wargame, possibly the subject of a different post at a later date. This post is a little bit of an interlude from describing how we developed the mechanics and implemented our approach, to talk about research. As there are a lot of very knowledgeable WW2 buffs in and around wargaming, we figured that it was important to do extensive research, so that we have defensible positions for the decisions we’ve made. We’re keen to make the game based on reality, but on the other hand, it cannot be so complex in its reflection of reality that it becomes less than attractive to play. So, as in all simulation games, we’ve made some compromises, and electing to present an umpired game, we do rely to an extent on the unknown umpire to use judgement to keep the game flowing, rather than to stick rigidly to the letter of the rules. Mission Command is primarily about command, control and communications. I describe it sometimes as a means of demonstrating that combined arms tactics – co-ordinating infantry, artillery, tanks, AT guns, other supporting weapons and air power – was fiendishly difficult. Pretty much any of the thousands of secondary source military history books show this, a good starting point being Antony Beevor’s best-selling books on Stalingrad, Berlin, D-Day, The Second World War as a whole, and his latest one, Ardennes 1944. John Keegan’s books are also excellent for an overview of the military aspects of the topic. This is just a small sample from an overwhelmingly long list. For the type of detail that we need for Mission Command, we have to go to primary sources, for which the Internet is a godsend. When I was writing my first wargames rules back in the ’70s (not for publication, I hasten to add! ), detailed source material was in very short supply, unless you had access to the British Library or university collections (which I did not at that stage). Now, a search online can pull up vast amounts of material, and it’s a problem of sorting the wheat from the chaff – information overload is a common problem. There are numerous collections, including the Bundesarchiv and the US War Department, as well as commercial, semi-professional and amateur sites with relevant materials. Various US organisations have published vast numbers of de-classified briefings on their own forces, and translations of German, Italian, Japanese and Soviet documents from WW2, which are invaluable. For example Lone Sentry and other websites have all the US Intelligence Bulletins, issued monthly from September 1942 to the end of the war. Combined Arms Research Digital Library has a whole collection of “obsolete” military manuals, and the US War Department makes much of this information freely available. For how it’s supposed to be done, we consulted various descriptions of national doctrines, for instance the German “Truppenführung” of 1933/4, and the US Field Service Regulations for Operations. Fortunately many such documents are now published (in English) and readily available on the Internet. However, theory and practice varied considerably, so eye-witness accounts and good quality detailed narratives are essential for investigating what actually happened – or might have happened. Divisional histories now abound – simply look up your favourites on Amazon for a flavour – and can give some detail, though often lacking the precision in terms of units, numbers and outcomes that are needed for accurate modelling. Some of these are devoted to praising their subject and many are purely descriptive rather than analytical, so I’ve found that cross-referencing from several sources is essential. It’s helpful to have divisional accounts from both sides. For example, for some of our Normandy scenarios we’ve compared the History of the 12th SS Hitler Jugend (Meyer), the Combat History of the 21 Panzer Division (Kortenhaus), the accounts of 43rd Wessex, 51st Highland, 3rd Canadian, and so on, to give us multiple perspectives on the same combat actions. For orders of battle, it’s tempting to go for easily available ‘official’ ones. However, while units might have been at their pristine best at the start of a campaign (though that’s debatable), once the fighting started, the formal orbats, numbers of men, and amounts and types of equipment were quickly reduced or varied. In addition, it’s important to remember that quoted strengths, particularly at division or higher levels, often included support troops in addition to combat troops, and in many cases the ‘tail’ outnumbered the fighting men. Written material was not necessarily accurate – even the legendarily bureaucratic German Army monthly reports were suspect late in the war – but sometimes that’s all the evidence available. An example of this classic issue that we encountered was how to establish the composition of a late war German Panzer Reconnaissance Battalion: there are several published ‘official’ orbats from 1943 through to the end of the war, but shortages of equipment, adequately trained men, and the simple fact that it took several months to change from an older pattern to the new one, meant that in many cases we’re using a best guess of its actual composition. Equipment lists would often state, for example ‘armoured car’, or perhaps ‘light armoured car’, because the precise type was not considered important. Non-standard divisions, like the 21st Panzer (neu), are even more difficult to pin down, owing to use of converted equipment from conquered countries, in this case mainly French. For this reason our scenarios may have listing that are quite different from “official” sources, as we’ve attempted to take into account likely attrition rates, and the statements of eye-witness combatants. For the potentially controversial issue of the effectiveness of weapons, we’ve reviewed multiple sources, including other wargames as well as primary sources with judgements of combat effectiveness and documents with field test results. Our view was that we’d go with our assessment of the ‘inherent military probability’ of effectiveness, taking into account as much evidence as we could realistically review. Fortunately the scale of our game (a vehicle model = 3-5 vehicles; an infantry figure = about 10 men) means that we don’t look specifically at individual shots at individual vehicles or men, but rather at the effect of a bunch of shots on a bunch of vehicles or men. At this scale, a KO on a vehicle doesn’t mean that all the vehicles have been knocked out, but simply that that group of vehicles is rendered ineffective – probably one or two have been brewed up, the others perhaps damaged, or the crews have removed themselves from the action. Similarly casualties amongst infantry are split between killed, wounded and ‘had enough’. However, in relation to tank and anti-tank guns, we still wanted to differentiate between types across the range of light, medium and heavy tanks, and across the whole war. We felt that the relatively coarse-grained approach of small, medium, large, very large guns (or similar) didn’t do justice to the variations from our research. There was a reason why guns were upgraded by increments sometimes within a single tank type, and that’s to do with their effectiveness in action. So we have a fairly large gun table – though it reduces a lot in any one scenario. In fact, there’s even more variation by type of ammunition used, but we shrank from that complexity – it’s far too complex to track the availability and selection of ammo type at our scale. In a couple of areas we would have liked to do that (specifically the 6 pounders in Normandy and later with discarding sabot ammunition, and the US use of Pozit fuses in late ’44), but we decided the additional complexity didn’t warrant it. Using similar reasoning our armour table has armour values from 1 to 10 to give sufficient variation to take account of strengthening armour across various models of medium tank over several years (for example the Churchill or Panzer IV), and giving realistic values to weakly armoured half-tracked troop carriers, stretching up to heavy tanks, such as the Jagdtiger. Our research into scenarios has also been very lengthy, though I’ve not yet been able to turn many of our play test versions into published ones – these will be following over the coming weeks. As I’ve mentioned, the divisional histories, especially those written by eye-witnesses are very valuable for reasonably accurate accounts of units involved, what happened where – corroborated against other evidence – and evidence of what combat was like. Some books written by military historians are strong on overall narrative of the ‘arrows on a map’ style, which don’t often cover actions at company, battalion or brigade level in enough detail for a coherent scenario. Some books can be very misleading (for example those by Stephen Ambrose), as they may be focusing on a good story, peddling a particular theory or simply repeating another person’s view without analysing it, instead of giving an account with evidence. For example, Stephen Ambrose’s story of German ‘tanks’ at Pegasus Bridge early on 6 June is entirely misleading, but has been followed in several accounts, and the exaggeration distorts the undoubted achievements of the forces taking the Orne bridges and those relieving the coup de main force there. Perhaps the most important part of our research is that as the game design, development and production continues, we also continue to collect, read, absorb and analyse new material. The game will likely change as a result until the final production version, and even then, as is the case with many wargames, contact with many many more players will result in further information and perhaps more revisions. Well, we managed a 2 player Mission Command (plus myself as umpire). Unfortunately Alan M and Shawn couldn’t make it for various (perfectly fine) reasons. David and Chris were the players, the British command team. David being obviously very experienced took the lead, while Chris, as a newbie to WW2, aided very competently. I ran the Germans as umpire. 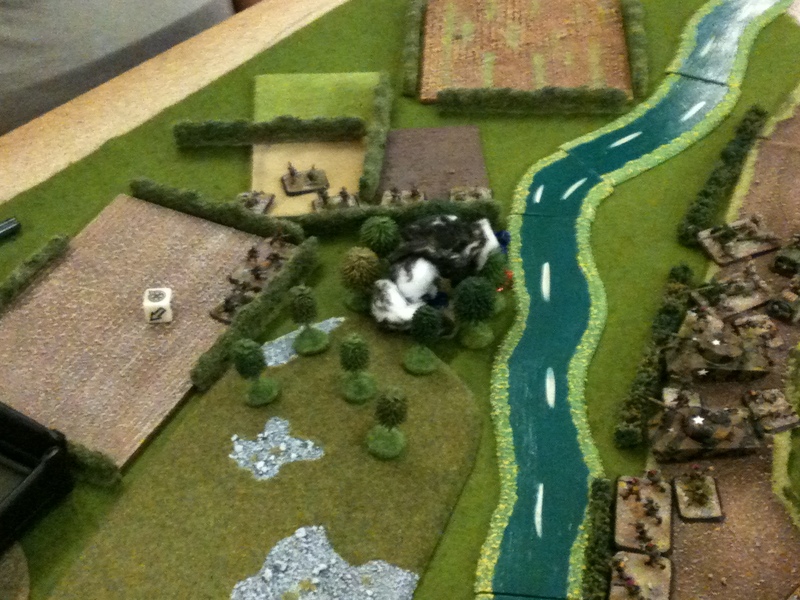 The Germans are pre-programmed by the scenario design, both in terms of starting positions and range of actions. The game is designed to teach the basics of the Mission Command rules in a fun way. There’s no expectation that the British won’t ‘win’. The British players have a battalion of elite British paratroopers in Normandy, a few days after the landings. They’re supported by a squadron of Shermans, a battery of 6 pounders and a couple of batteries of 75mm pack howitzers. The enemy, reported by recce, is a company of panzer grenadiers from 21 Panzer Div, somewhat mauled already, but with supports expected. Terrain is typical Normandy terrain – not the full bocage, but plenty of thick hedges, patches of wood, the odd farmhouse and quite a lot of open terrain, mainly flat but some ridges. The physical area of the game is only 1.5km by 2km (1mm to 2m), so it would fit on a fairly large dining table. 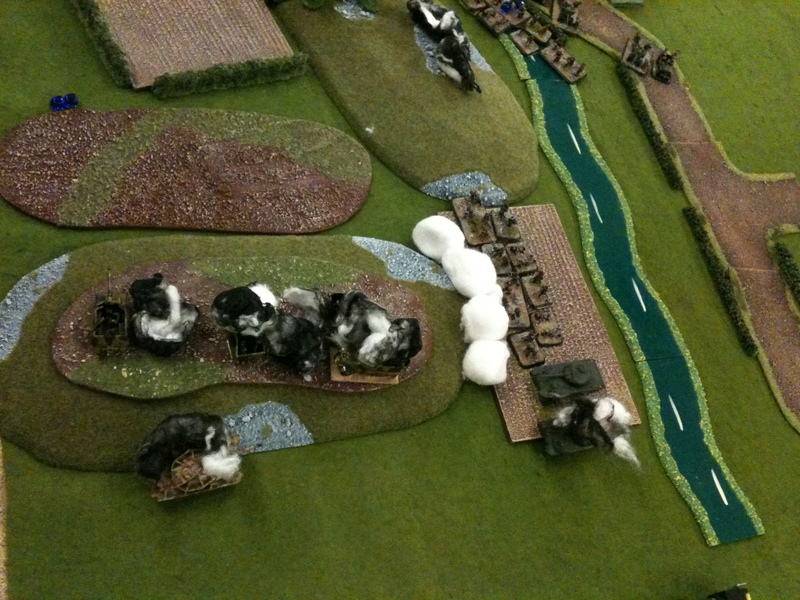 The British objective is to get to the ridge on the southern edge of the board. I tend to stress the idea of ‘having a good plan’ (revolutionary, eh?). David rose to the challenge, and the British had a fairly standard first phase of 2 companies leading the attack on an intermediate ridge objective, with a third company and the AT guns supporting and some reserves standing by. Mortars supporting from just on-table, artillery off-table. I permitted them to attach a couple of tanks to their left-hand C Company (possibly a stretch, because British didn’t do this type of integration till later in the campaign), while the other 2 Shermans were supporting from the centre, so could be brought to fire in support of either lead company. Following on from phase 1, the team planned for a phase 2 assault of the final ridge. The first 3 turns or so were very quiet – in MC terms this is ‘cold’, and movement can be doubled. The left-hand company reached the isolated farm and found it unoccupied. Two companies prepared to storm the first ridge, though interestingly it turned out that the supporting company led in the end, as the initially proposed lead company was not quite as close to the enemy as suspected. The Germans, concealed in dense woods beyond a hedge, reserved their fire till an element of paras crossed the hedge, then opened up with small arms and LMGs. This element was pretty much wiped out, but David had sensibly withheld the rest of the battalion, so damage was limited to the combat recce guys. David’s response to locating the first group of Germans was fairly typical (I think) of Normandy actions. Call in the artillery, oh and the mortars, and a couple of Shermans, and most of two companies worth of small arms fire. There was a very big risk of friendly fire with the artillery bombardment, which might have been very costly, but all the shots went in accurately, somewhat against the odds. The Germans were in cover, so weren’t immediately destroyed. They also had high morale (perhaps misguidedly), stayed put and shot wildly back to no effect. The remaining Germans in that outpost were wiped out in place, though some transport – the French conversion U307(f) – got away back to the main German position on the south ridge. Supporting German 10.5 cm fire came down on the right flank of A Company, so they ‘avoided it’ into some woods. U207(f) (Becker conversion) flees from the carnage. German artillery strike in the background. About an hour had passed. The lead company on the left with no opposition had moved cautiously forward about a kilometre and the final objective was another kilometre in front. There was a pause as new orders were required for everyone at the achievement of phase 1 objectives. 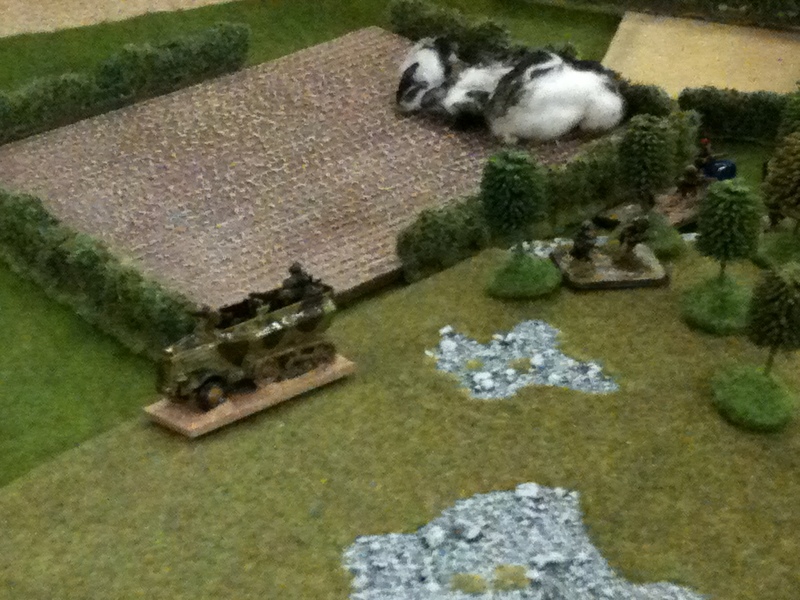 Some desultory MG42 fire from ‘somewhere’ kept their heads down. Most of the British casualties had been taken by A Company, so David switched to B Company to lead the main assault from the phase 1 ridge towards the final ridge, while C Company (Chris) outflanked the final ridge from the west. A Company was to support from the east, but keep behind hedges if possible. The reserve tanks to stay concealed at the edge of the woods and engage enemy vehicles. Mortars to give smoke in front of C Company and the 2 Shermans, all the artillery to plaster the ridge, then go in on ‘lift’ of the bombardment. Good plan actually. Deploying for the attack, it was (naturally) A Company that encountered the enemy – a flanking force in ambush to the east opened up on them and A Company retired precipitately back into the woods. This had the potential to slightly slow up the co-ordination of the artillery bombardment, because the FOO was with A Company, however, as throughout this scenario the RA did the biz marvellously (I don’t think they failed to hit first time at all). David switched the 2 Shermans in the woods to the support of A Company and this force spent the remainder of the game exchanging fire with the ambushing Germans, who failed to give way or to advance. 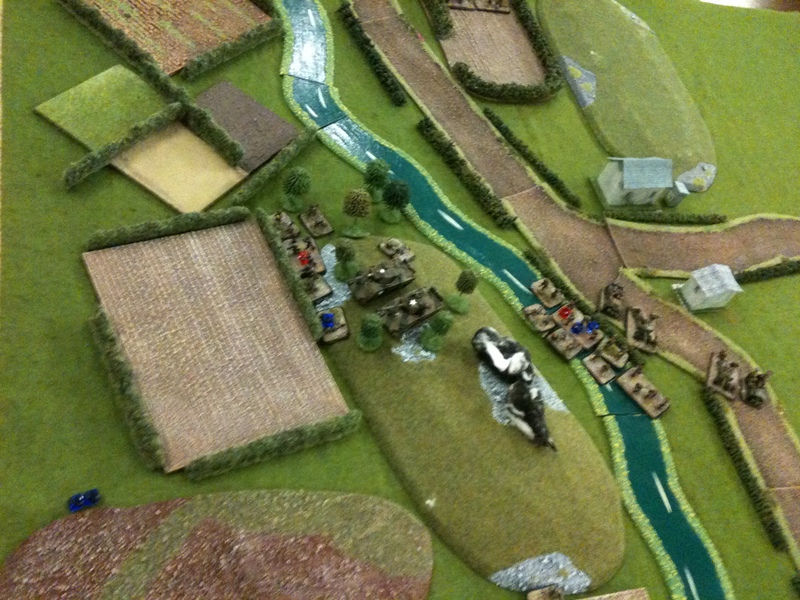 Final Position 1: Shermans and A Company ready, but Germans have fled. Note red markers = casualties, blue markers = suppression. B Company have retired from German artillery strike. Denoument: Explosions rippled all along the ridge line, while the mortars maintained the smoke screen for C Company outflanking to the west. Just to the south of the smoke beyond the ridge line, a Sherman pushed forward and and was discovered with extreme prejudice by a Panzer IV on the far side of the reverse slope of the ridge. 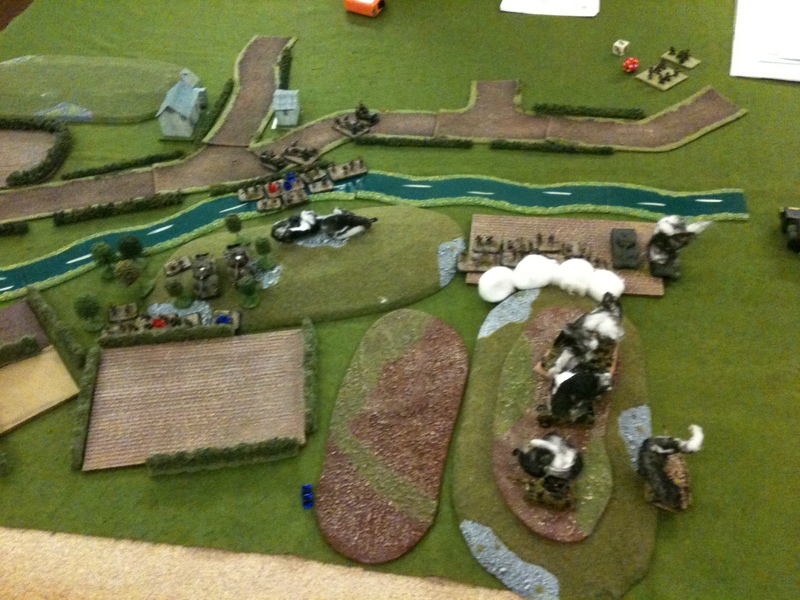 The German panzer then unwisely moved forward to engage the second Sherman and was brewed up in turn. Final position 2: at southernmost ridge. The weight of the barrage had fallen on the remains of the German company only hurriedly dug in (no prepared positions in this scenario). As you might have expected, they attempted to flee, leaving the burning wreckage of a couple of PaK 40s on H39s and some U307s hull down on the ridge. The PaK 40s might well have been important if the Shermans had pushed out of the woods; they’re lethal at up to a about a kilometre range. The British captured a couple of elements of Germans fleeing on foot, while some in transports managed to escape. Overall the British lost about half a company (mostly from A Company) and 3 or 4 actual Shermans (one model), while the Germans lost about 2/3 of their force including Kampfgruppe Klein’s commander in the Panzer IV. Final position 3: the whole field. German prisoners top right. The British performance (IMHO) was very good. They had a plan, adapted it to circumstances, and importantly didn’t do anything impetuous, making excellent use of their artillery and mortars. The Germans in the outposts paradoxically could have done with failing a few morale rolls, as it would have got them out of danger quicker, and back to the main line of resistance. I enjoyed it, and I hope David and Chris did to. Next time, we should have two sets of players!